District Engineer Jon Huseby of the Minnesota Department of Transportation is the 2019 recipient of the Center for Transportation Studies — Distinguished Public Leadership Award. According to the University of Minnesota, the award, which was established in 1998, recognizes public leaders who have influenced innovative transportation policy directions that benefit society through their vision, leadership, and knowledge. 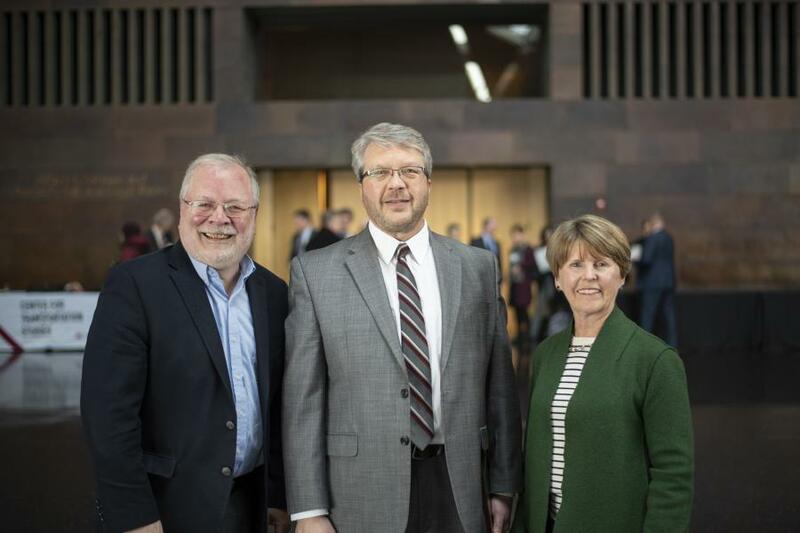 Huseby received the award during the 2019 Annual Meeting and Awards Luncheon for the Center for Transportation Studies, University of Minnesota, held Feb. 20 at the McNamara Alumni Center in Minneapolis. As the leader of one of MnDOT's eight districts, Huseby is involved in many statewide transportation initiatives at MnDOT. He also is a member of the Transportation Policy and Economic Competitiveness Advisory Board at the Humphrey School of Public Affairs and the Minnesota Freight Advisory Committee Executive Board. "Transportation connects to all parts of our society. It affects the economy and our quality of life, from moving commuters to moving freight in the Metro and Greater Minnesota. We're all part of a transportation network," said Huseby. "That's what drives me to be involved so that we as an organization get a good understanding of how the decisions we make affect businesses and highway users in southwest Minnesota and across the state." Huseby has more than 35 years in the transportation industry, including work in the public and private sectors. He holds a civil engineering degree from North Dakota State University, Fargo, and is a licensed professional engineer. In 2013, Huseby initiated the Manufacturers' Perspectives on Minnesota's Transportation System in MnDOT District 8 as a business outreach, bringing a manufacturer's perspective to the table. That outreach has now expanded to four other districts and played a role in redefining the Minnesota Freight Advisory Commission. Huseby said he was surprised and honored to receive the award. "Receiving an award for something that I have a passion for doing was never expected," he said. "I feel very fortunate to be working with great people at MnDOT, and with our many partners." Past award recipients have included state and federal legislators, local government officials, and others concerned with transportation issues for Minnesotans.